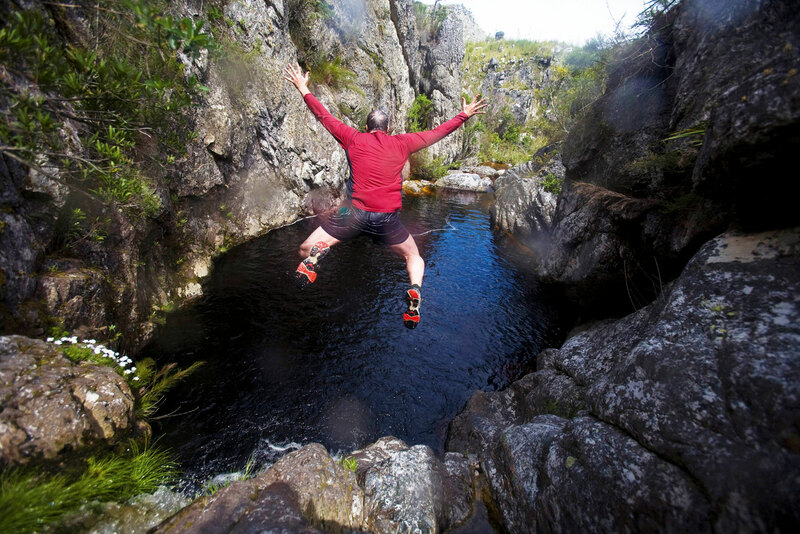 Todd Pitock tries his hand at 'kloofing' at Cape Town's Suicide Gorge. World Premier cold water swimmer Lewis Pugh jumps into a pool while ‘Kloofing’ at Suicide Gorge near Cape Town, South Africa. Todd Pitock tries his hand at a South African extreme sport known as ‘kloofing’ with world premier cold water swimmer, Lewis Pugh. Waterfalls course through cape granite forming deep pools at the base of the cliff, which runs in a series of ladder steps down through a trail called Suicide Gorge. We stand on a ledge of striated granite looking down at the huge drop. But the risk of falling isn’t the problem. The problem is that the only way forward is to jump. We had already braved a couple of lower jumps, perhaps 15 feet high or so. But we know ‘The Big One’ – a leap equal to five stories – is yet to come. Although not there just yet, it’s hard to guess how high we are. As we peer down it feels like we are looking into the moat from the castle tower. I had met Lewis Pugh, the world’s premier cold water swimmer, several years ago in Norway, where he was training to swim at the North Pole – wearing only Speedos, a swimming cap and goggles. In Norway I’d braved the waters of the glacial lake and clumsily given him the impression that I was game for any lunatic adventure. So here we are now, along with Michael Walker, a photographer from the Cape Times who had grown up with Lewis in Cape Town, overlooking Suicide Gorge. From above, the water is black, shadowy and looks very cold. At eye level it had a faint red-orange colour. “Why does the water look like rust?” I ask. “The fynbos,” Lewis tells me. To get into the gorge, we have to walk through a panorama of fynbos, the Cape’s native flora. In December the fields are lit by buttercups, sprouts of fuscia, and some plant with a blood-red stem and green leaves. “The fynbos… really? Or maybe there’s a nuclear plant upstream,” I contemplate. South Africans have a high adventure quotient. People rappel off Table Mountain and dive to see shipwrecks and sharks, they surf and kayak among pods of whales migrating from Antarctica. They swim in the gelid and turbulent Table Bay, or race 56 kilometres by foot between the Atlantic and Indian oceans. A week before this, Michael covered a riot that deteriorated into full-on urban warfare. That I was psyching Lewis and him out just by sitting there was strangely emboldening. I had to go, or face the cost ­– never mind the humiliation – of calling in a rescue. Yet, jumping did indeed require two apparent opposites: control your body but surrender to the circumstances. I looked below, inhaled twice, and leapt. I felt my viscera rising as the rest of me fell, as if the laws of gravity were, for an eternal moment, suspended just for my abdominal organs. I draw my heels together and my hands to my sides to enter the pool vertically, not smack the surface. The water is so cold it is like having my flesh brushed with refrigerated paint. To add further pain to my glory, I have to swim over one hundred metres in this icy water surrounded by sheer rock walls, with nothing to hold onto. I don’t know how many jumps we do, but they become less fearsome as jumping became more familiar, and the hypothermic water becomes less shocking, if not less wearying. As we continue on, somehow we take some wrong turns… hours pass, but our only wristwatch has stopped working so we don’t know how many. Eventually we come upon a field of huge stones bleached white by streams of sunlight ­– a rare sight to see at other areas of the gorge. We empty our soaked rucksacks, and lay like lizards on the warm boulders. After snacking on biltong, we begin walking again, glad to be dry. As we venture lower, the gorge’s walls, terraced by crusty Table Mountain sandstone and landscaped by gnarled trees emerging at an angle, grow higher. And then we are faced by a startling sight: The Big One, the five-storey jump. By now there is no more ceremony, and in any case, still no choice; this is, we realise, only the halfway point.